What if Your WHAT was Ripped Out from Under You? 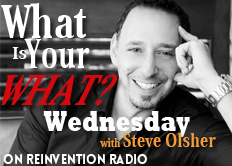 Steve puts forth some very thought provoking questions with regard to what you would do if your WHAT, the one amazing thing you were meant to do, was suddenly ripped out from under you? He also wonders if something good always does come from something bad.